A hamster which has lost a lot of hair due to a skin condition has been found abandoned in a cage under a bush at Arthur's Seat in Edinburgh. 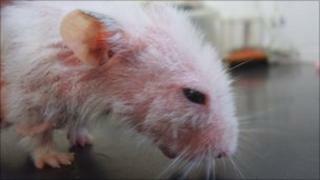 The white male hamster was found after a walker went to investigate what her dog was sniffing in a bush. The pet was found near Meadowfield Drive on Monday. The Scottish SPCA, which is now caring for the animal, said abandoning an animal is an offence that carries up to six months in prison or a £5,000 fine. The hamster is now being cared for at the Edinburgh and Lothians Animal Rescue and Rehoming Centre, where staff have named him Arthur. Inspector June Chalcroft, of the Scottish SPCA, said: "It's likely the owner has panicked about Arthur's skin condition and decided they didn't want him anymore. "He's lost a lot of hair and the vet thinks it could be hormonal or due to his age. "His condition might clear up with the right diet. For now we'll just have to monitor him and hope he recovers. "He's a really friendly and well handled wee guy so he's obviously been someone's pet. "Whoever left Arthur has been particularly cruel by hiding him under a bush where it was unlikely he would be found. "Although there was food and water in his cage, he would eventually have starved to death, so we're keen to track down whoever owned him."